I took a ride with ghosts yesterday. They stayed with me through two hours of roads, and some off-pavement stuff that had me grinning. The sun was out, which is nice, but it was also warm! Well, at least getting near 60, which is warm enough. Okay, not warm "enough", since I really like it when it's in the high 70's to low 80's, but for March, I'll take it. Certainly it was warm enough for shorts. As in no additional leg coverings (!!). My normal lower-body dressing for riding starts with shorts, shoes, and socks. Add knee warmers if needed (below 60), toe covers or oversocks. Below 50 and I have the toe covers and oversocks, tights over the knee warmers. Below 40 it's the winter shoes, and I'm contemplating wind-proof tights. I wore an orange jersey, a Christmas gift, for the first time. As I was leaving, my wife said I'd be bright on the road. But she wasn't looking at the jersey. Yep, after a fall and winter of indoor trainer rides and layering on the lower extremeties, my gams are pale. The ghosts were brought out. Sorry to all you folks blinded by the glare. But after just a little over a two hour ride, I have tan lines. 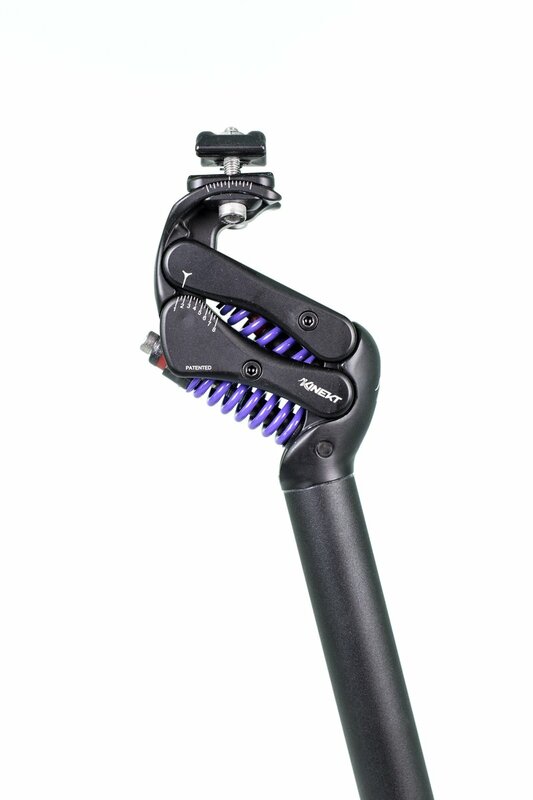 Let's start off with this disclosure: I have been selected to be a brand ambassador for the Kinekt Bodyfloat suspension seatpost, and as such was provided this product free of charge for testing and promotion purposes. 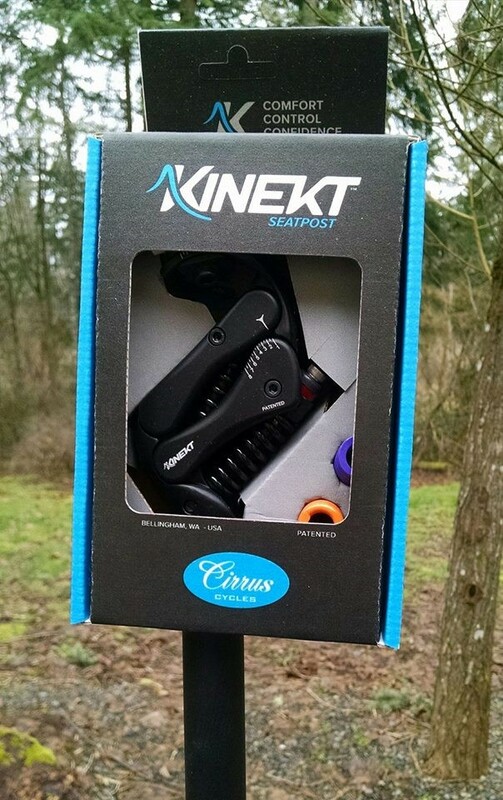 I'm not paid to do this -- in fact, Cirrus Cycles (makers of the Kinekt seatpost) insisted that I give honest feedback. Now let's get to why I'm excited about this. For many years, when I was bike racing, I rode on Softride bikes. They were rare in bike racing, illegal for international competition, and often looked at with disdain by the tradition-bound within the sport. I landed on Softride after riding for several years on standard double-diamond frames, in long distance cycling events and triathlons. After a particular triathlon, run over heavy chip-sealed back-country roads where my backside went numb from vibration, I was looking for an alternative. 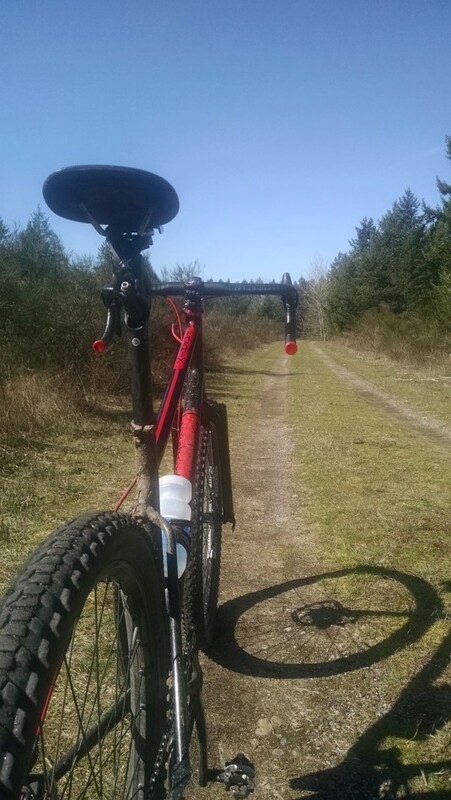 I'd heard about Softride, and after another triathlon in Bellingham, took a test-ride on a Sofride on the Kulshan Cycles sales floor. I was instantly sold. Within minutes I was looking for things to ride over -- manhole covers, railroad tracks, etc. The plush ride, while maintaining the stiffness of the main frame, was eye-opening. I contacted Paul Barkley, one of the initial designers of Softride and framebuilder for most of the first generation of Softride branded frames. 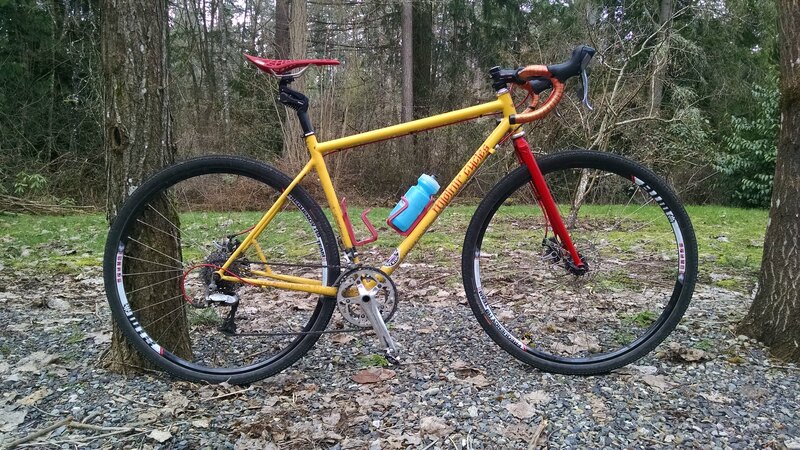 I trekked back up to Bellingham to get measured, and a couple months later had my first custom Softride frame. I had two more built by TiCycles in (then) Seattle, one a track bike built on 650c wheels (I needed all the help I could get with low-intertia wheels for acceleration). To say I was a believer in the Softride system would be an understatement. Even though the system was heavier than a standard frame and seatpost, I gladly dealt with the weight penalty for the comfort. The advantage wasn't that the frames were faster, but more that the damped out vibration had a long-term energy sparing effect, essentially leaving more in the tank towards the later miles. And I never felt like the weight held me back on hills (I was actually at the pointy end when it came to climbs). The feature that made the Softride such a success was the active nature of the suspension -- there was no "stiction" to overcome in order for the suspension to move. But there were issues with the Softride system, namely the mounting of the beam to the frame. I had a few of the through-bolts fail, one in an event. And the aluminum disks had a nasty tendency to crack along the lip where they interfaced with the cross-tube on the frame as well. After Softride sought (unsuccessfully) a buyer for their business, the spare mounting hardware essentially dried up, making failed parts become stored and unusable frames. my first look at the BodyFloat post. 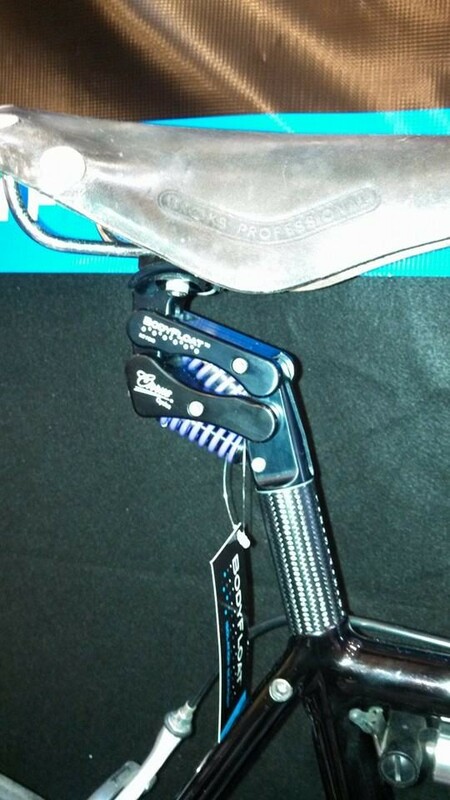 I was first introduced to the Bodyfloat seatpost at the Seattle Bike Expo in March, 2014. I noticed the same Softride demo rig in a booth, then saw Paul Barkley, this time demonstrating the effectiveness of the Bodyfloat product. It instantly took me back to riding the Softride -- though not with the amplitude of response, it had the same movement and active nature. I took their information, looked up the product, and tucked it away in the "must do some day" file. Fast forward a few years, after doing a whole lot of off-pavement rides, I'm in the process of building my next gravel bike, and had designed it around the 25mm offset of the Bodyfloat seatpost, with the idea that I would be fitting it onto this frame. I inquired with Kinekt regarding their current generation of seatposts, which are offered in a 12mm offset, and that's when I noticed the link for applying to be a brand ambassador. After a discussion with the head of the ambassador program, I was given the green light. So that brings us to today. it out on the bike! 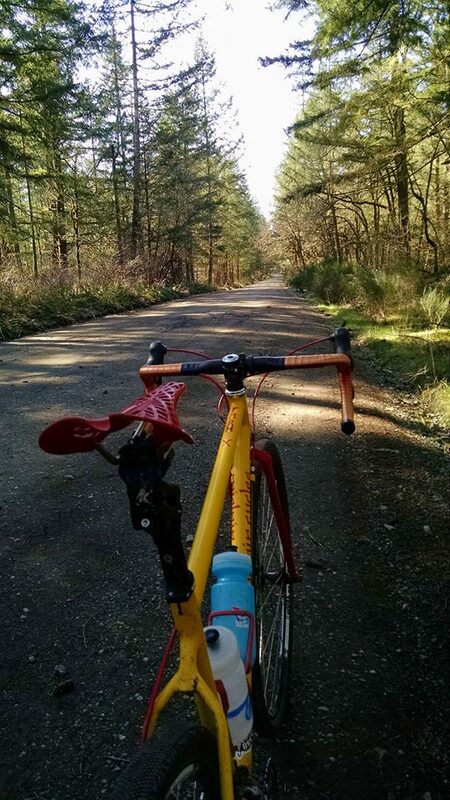 The seatpost came on Thursday, and almost the first thing I did was put it on my Mjolnir Cycles Vidarr gravel bike. Almost, because I had to clean/ream the seat tube first -- something I hadn't done when I built the frame four years ago. Per the instructions, I added one centimeter to the seat height, and used the same setback. What I didn't do, however, was set the preload such that the saddle didn't move up when it was unweighted. There are two reasons I did this: (1) the nature of the Softride system was very active, with no preload, and I wanted to duplicate that feel as much as possible, and (2) I didn't have a second person available to watch me unweight the saddle. Today (Friday), I took it out on the maiden voyage. The ride difference was immediately apparent: Plush. My driveway was recently rendered a third-world runway by the need to replace the water line, so it's pretty bumpy. I could feel the bike moving under me, but the saddle just changed pressure against me, without forcing me to move along with it. It immediately reminded me of my old Softrides. My ride was a little over 35 miles of mostly familiar backroads, some of varying quality chipseal. And even though the tires I was running are 700cx42mm Continental Speed Rides at 58psi (rear), I'm very familiar with how they feel on these roads -- meaning I still feel it in spite of the air volume of the tires. The Kineckt post is so active that all the variations in the chipseal surface just melted away. 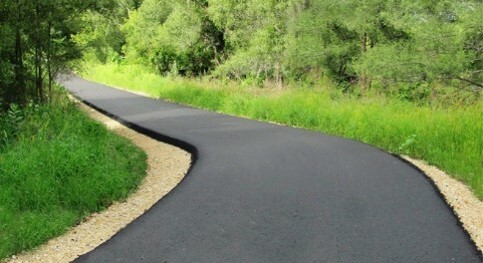 The test bed: my current gravel bike. I came home smiling, impressed. As stated earlier, the ride is very much akin to the Softride, which makes sense since it shares many of the same designers. I didn't take it off pavement (much), so that review still remains. I expect that will happen within the next two days. One might ask about the weight of the Kinekt post, and yes, it is heavier than a normal seatpost. How much? I didn't weigh it, but the difference is far less than that of the Softride system. In fact, unless you're at a bodyfat percentage where people are constantly asking whether you're okay, you could probably lose the weight difference from your body in a week's time without drastic lifestyle changes. I certainly didn't notice the added weight on my bike, either climbing (where weight really becomes a factor) or standing and swinging the bike. So the verdict? Two enthusiastic thumbs up, so far. The Cirrus Cycles Kinekt seatpost does essentially the same job that the Softride system did, with many other pluses going for it: much lighter weight, legal in USAC and UCI racing (I'm pretty sure -- I'll have to check on that), and doesn't require an entire new bike frame for best execution. This will add rider isolation to any bike with a round seatpost. There's a common reply when some one claims some extraordinary feat or accomplishment on any kind of social setting (whether social media or in conversation), "Pics or it didn't happen!" It's said it jest, really (at least normally so in my experience). Well, in cycling circles (social circles, not literal riding a bike in circles), there's a twist on that response -- "Strava or it didn't happen!" Anyway, today was a ride that didn't happen. I usually track my rides via Strava on my smartphone. I start it up when I push off to start a ride, put it in my jersey pocket, and don't touch it again until I'm done. I don't even have a speedometer on my handlebars any more. I kind of ride "unplugged", and just check the speed, distance, and sometimes the segments (if the system flags me and tells me I did well on a particular segment) after the ride is done. But today, I was in a hurry, starting a little earlier than normal to fit a ride in before a noon meeting. When I got to the locker room to suit up, I realized I'd left my phone on my desk. Not wanting to sacrifice the time to go get it, I rode without, and just used my wrist stopwatch to time the ride. I estimated the average speed (it's usually within a couple tenths of a mile-per-hour) to get the distance. I'm fine with that. At least until some one puts me to the test on it (not that I expect anyone to do so, especially since I don't crow about what an accomplishment the daily ride might be). But if they did... It didn't happen. As some readers may know, I put on two multi-surface bike rides each year (or three, as the second one is a two-day affair). They are now in their fifth and fourth iteration in 2018, respectively. But, being the nature of out-in-the-real-boonies service roads (in some cases that's being generous), I find it necessary to recon the route before event day, in case there are last-minute changes needed due to washouts, major construction, or in some cases paths that have disappeared entirely. Such was the case for the second leg of the Lucky Mashochist's Gravel Deuce, 2017. I ventured out two weeks prior to roll-out day to make sure the roads were clear enough to ride. I wasn't concerned with the first day route so much, since it's all on forest service roads in Capital Forest -- roads that get quite a bit of traffic most of the year from recreationalists of all types. But the second day route takes in logging areas and real back-woods. 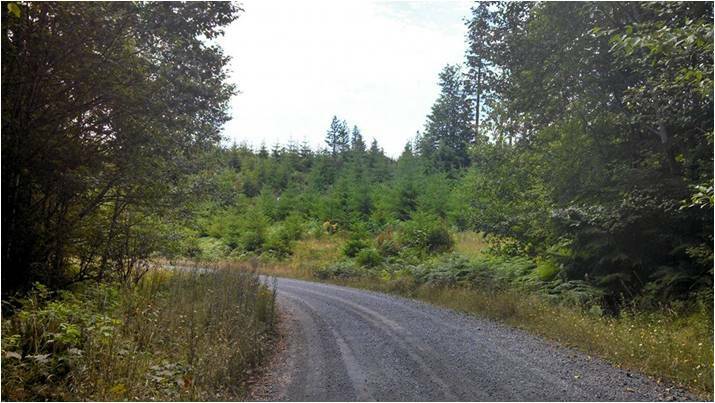 Each year the first off-pavement sector had been varying degrees of overgrown on the southern exit, and fairly recent logging meant that the northern entrance might be impassable. But this past summer the first sector was fine, it was the second sector that caused the problem. The last descent had caused wash-out ruts across the road, but was still passable (even though I took it on foot). This time around, as I made the descent, I noticed that the path was increasingly encroached-upon by small trees and such. And when I got to the bottom, I came to a screeching halt. 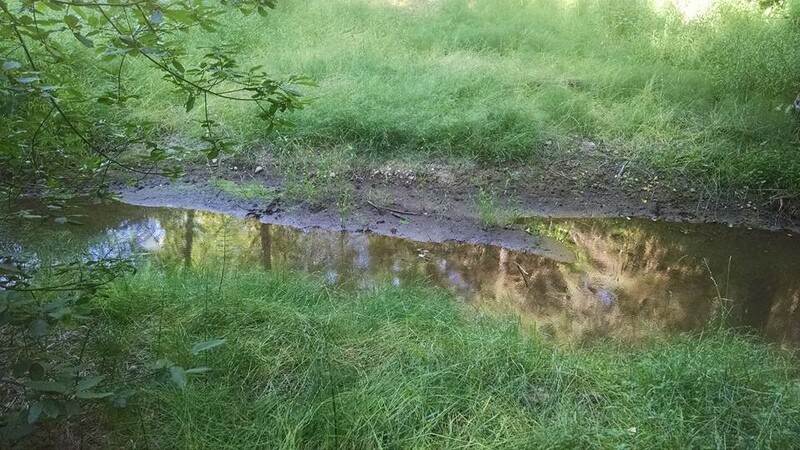 What had been a wide trench, though dry, in 2016, had become a deep ravine, some 20 feet wide and a good 6 feet deep to the water, with a bottomless layer of silty mud underneath. I tested the depth with a couple rocks, and watched them disappear into the murky abyss. I looked around for any potential to build a quick bridge across the chasm, but since I had not thought to bring a chainsaw, aside from the fact that the resulting noise would have brought some unwanted attention, I ended up turning back the way I'd come. Which was about 6 of the 7 miles of that section. I looked for another branch off that road that might punch through, but alas, everything else just petered out to dead ends or vanished into impassable overgrowth. Fortunately, there was a paved option that offered a nearly identical distance, so I remapped the route and vowed to look for another off-pavement option for 2018. Sure, there are some options, which will have to be scouted out to make sure they (1) actually connect through, and (2) don't cross hostile private property. Yes, I will always ask permission on any private access, but sometimes the answer is clearly "no" before the question is even asked. So I may be making a sojourn back to that muddy river to build a bridge some time this spring/early summer. But I'll come at it from the other end.